Maybe you don’t realize it. 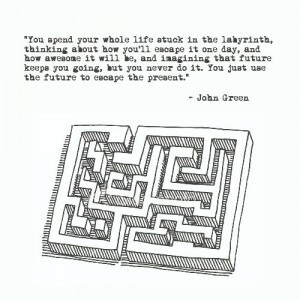 Maybe you do realize you’re stuck, but you’re unsure of what the next step is. Maybe you know what the next step should be, but you tell yourself you can’t take it. Maybe the reason you’re using to tell yourself you can’t take the next step is actually an excuse for not taking any action at all. Maybe you’re making excuses for staying where you are because you’re still convinced in your mind this is the less risky choice. Maybe you’re telling yourself that staying where you are is less risky until you reach a certain milestone (30 years and a gold watch, when the kids are grown, when you’re fully vested in your 401K, whatever). Maybe relying on a milestone to give yourself permission to do what you’ve always wanted to do is actually riskier (what happens if you don’t reach the milestone? ), but you won’t know that because you’re unsure of what the next step is. Maybe you don’t realize it, but . . . You’re stuck. I recognized it 11 years ago. Because of poor resource allocation and management decisions, I wound up in a position where I was the only one in my group that could legally provide training for the ongoing license class. I was also the class coordinator, responsible for schedules, exams, records, etc. I remembered this five years later and retired as soon as I was eligible, even though the work conditions were much more tolerable.